A pedalboard-friendly reverb pedal that can be constantly refreshed with different versions of the effect. TonePrint function; compact size; 9V DC operation; adjustable pre-delay. TC Electronic's TonePrint facility enables a range of sounds to be loaded into the Hall Of Fame. Note the two-way switch to select short or long 'pre-delay' for the reverb types. When TC Electronic launched the first of its TonePrint series of pedals last year, the company was getting back to basics and getting all 'now' at the same time. The basics bit was these were compact, pedalboard-friendly, battery-powered stompboxes - a departure from the more complex Nova series. The 'now' bit was that the pedals could be constantly re-jigged by loading them with new sounds called TonePrints. Each pedal, besides the requisite knobs for tweaking, has a small number of selectable sound variations, one of the variations being TonePrint. Each of the sound variations represents a different configuration of a host of internal parameters and the TonePrint facility enables you to load a new configuration of those parameters, designed either by TC itself, or by a range of popular guitar and bass players. Adding a reverb pedal to your set-up can open up a range of ambient vistas to explore, and the Hall Of Fame has loads going for it. TonePrints are freely available from TC Electronic and can be loaded into the pedal either via a USB computer connection or a free TonePrint app, beamed wirelessly from a smart phone. 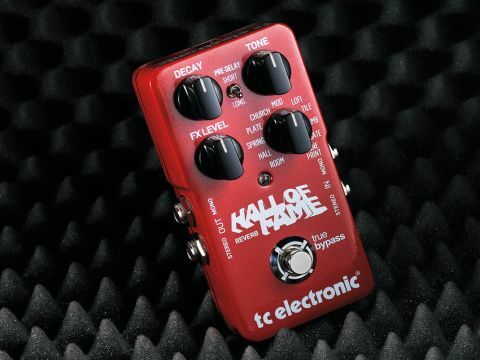 The Hall Of Fame is the reverb pedal in the TonePrint range. It has the same form factor as its sibling delay, vibrato, chorus and flanger pedals that we looked at previously before the actual TonePrint loading facility was active. It can run from a 9V battery or a standard adaptor. Battery access is by removing the pedal baseplate via a large chromed screw that moves easily, once loosened with a coin or screw. A pair of dipswitches inside the pedal can select between the default true bypass switching and buffered bypass and set a 'dry kill' mode so you just get the effect with no dry sound when the pedal is used in an amp's FX loop. pre-delay - long giving a little more breathing space for your notes before the reverb kicks in. A large rotary switch chooses between 10 different reverb types or the TonePrint. The 10 settings give you all the reverb types you could reasonably want as a guitar player apart from, if you're into off-the-wall sonics, a reverse reverb. A spring simulation is often essential for those without one built into their amp, and the HOF's spring recreates the flavour very well. Elsewhere, the simulations of various real environments add a realistic sense of space while the ambient setting can usefully add a bit of the sort of 'air' you might get by moving a microphone a little further out from a speaker cab. Some will like the modulated delay, others may think there is too much of a chorus effect applied. But that may be where the TonePrints will earn their keep, as there are several different modulated options such as a chorused church and a couple that combine plate reverb with flanging. The default TonePrint setting that comes with the pedal is a dynamic spring reverb that turns the reverb up and down depending on how loud you play, but TC Electronic has plenty more available. The current set of artist TonePrints includes ones from Paul Gilbert, Troy Van Leeuwen, Soren Andersen, Brett Scallions and Harry McVeigh of White Lies. OK, these might not all be household-name players, but they've come up with some cool sounds - we especially like Troy Van Leeuwen's Vibrato Spring and Paul Gilbert's Otis Fieldsgood TonePrint, which adds a nice ambience to sustained notes. Adding a reverb pedal to your set-up can open up a range of ambient vistas to explore, and the Hall Of Fame has loads going for it. Not least that it's dead easy to operate, and will take up less space on your pedalboard than any other comparable unit that we can think of. The jam in the doughnut, though, is the TonePrint facility, which means that you will have a constant source of interesting new reverb sounds.